Vetcare - Veterinary Medical Centre assists their client in relocating their pets by performing some of the necessary medical procedures (blood tests, de-worming, microchip and others) and providing with authorized, professional and trustful affiliated relocation companies. Never the less the full responsibility in regards to documentation , import permits, arranging flights, further necessary permits or other is sole responsibility of the relocating companies and we are not taking the responsibility for them. The Vaccination should state clearly the details of the date of insertion of the microchip and details of the vaccinations. Please note that it is essential that the Microchip should have been inserted prior to the last vaccination for rabies. The pet must have a Microchip (microchip must be ISO standard, NOT AVID) for identification purposes which must be recorded on your pets vaccination card/book and if required on the Rabies Serum Neutralization Report. Dogs and cats must be vaccinated for RABIES within the last year or 12 months (if recently administered 21 days should elapse after the rabies vaccination date as a condition for allowing the pet to enter the UAE). All vaccinations must be current and therefore valid. Pets under the age of four months cannot enter the UAE. A valid health certificate will be required from the country of origin, confirming vaccinations, that the microchip was in place prior to the last vaccination for rabies and that the pet is in good health generally. A Certificate for Rabies Serum Neutralization test if applicable. Australia, Austria, Andorra, Ascension Island, Antigua & Barbuda, Aruba, Barbados, Bahrain, Bermuda,Canada, Cayman Islands, Chile, Croatia, Cyprus, Denmark,Fiji,Finland, French Polynesia, Falkland Islands, Germany, Gibraltar, Greece, Hong Kong, Iceland, Ireland, Japan, Jamaica, KSA, Kuwait, Liechtenstein, Luxembourg, Monaco, Malta, Montserrat, Mauritius, Mayotte, New Caledonia, New Zealand, Norway, Portugal, Qatar, Saint Vincent & the Grenadines, Saint Kitts & Nevis,San Marino, Singapore, Spain, Sweden, Switzerland, United Kingdom, U.S.A,Vatican City, Vanuatu, Wallis & Futuna. For countries that are not mentioned in the group: The certificate should be from governmental laboratory or accredited laboratory. All documents should be in ENGLISH or in the original language with English translation. 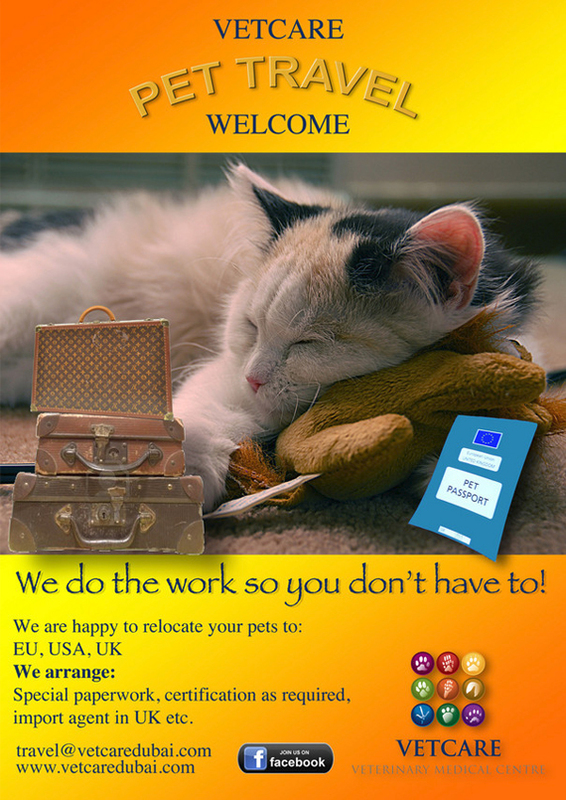 Before the travel please contact your your pet relocation company and check if the requirements for pet import or export has not changed .Some of the government rules and policies may change in regards to import & export of pets without prior notice.